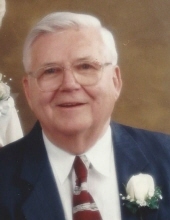 John E. "Jack" Shanahan Sr. Celebrating the life of John E. "Jack" Shanahan Sr.
Obituary for John E. "Jack" Shanahan Sr.
Beloved husband of the late Patricia “Pat” (nee Eckenstein). Loving father of Patty (Phil) Connors, Jack (Patty (the late Gloria)), Dan (Debbie), Tim (Liz), Reverend Michael Shanahan, and the late Larry Shanahan. Dear grandfather of 13 and great grandfather of 12. Fond brother of the late Dolly (the late Jack Sheehy and the late George Goggin), and Jim (Gerry) Shanahan. Kind uncle of many nieces and nephews. Funeral Thursday 10:15 a.m. from the Robert J. Sheehy & Sons Funeral Home, 9000 W. 151st Street, Orland Park, IL to Our Lady of the Woods Church, Mass 11:00 a.m. In lieu of flowers donations to Mulliganeers, P.O. Box 213, LaGrange, IL 60525, and Weish 4 Ever (Andrew Weishar Foundation), 4948 145th St., Midlothian, IL 60445, would be appreciated. Funeral home opens at 8:00 a.m. Procession leaves the funeral home at 10:15 to go to church. "Email Address" would like to share the life celebration of John E. "Jack" Shanahan Sr.. Click on the "link" to go to share a favorite memory or leave a condolence message for the family.